So Now I need almost any major set PHILLIES card and This includes Bowman Donruss, Fleer, Score, Upper Deck and almost any other one. I had this page almost updated from last year when I could not get to my site when I forgot to save it or even Publish it. 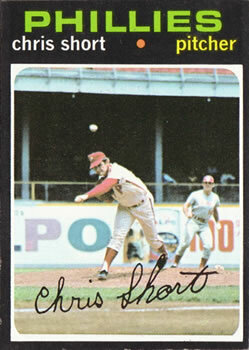 If I collected one of every card a Phillie is on in 1967, in the TCDB library, I would have a collection of only 128 cards. 2 out of 3 isn't bad is it. Re-newed hope with a young team, and some veterns. - Cards from players acquired after card was printed. Example a mid season trade. Cards from players acquired after card was printed. Example a spring or mid season trade. I have some of these years completed. If I collected one of every card a Phillie is on in 1980, in the TCDB library, I would have a collection of only 268 cards! DONRUSS - 131 Pete Rose ERR: Says "see card 251"
131 Pete Rose COR: Says "see card 371"
FLEER - 24 b Kevin Saucier P2 KEN of front and KEVIN ob back. If I collected one of every card a Phillie is on in 2016, in the TCDB library, I would have a collection of 2,650 cards!